10 August 2018, at 12:00a.m. The Chinese authorities reported an outbreak of ASF in domestic pigs in Liaoning region, north east China on 3rd August. According to the disease report clinical signs were first observed on the 1st August in 47 animals, however, the exact number of animals on farm is unclear as different reports state between 300 and 8,000 pigs. This is the first time that ASF has been reported in China. See map for location of the outbreak (OIE, 2018). Disease control measures are in place including culling affected and susceptible animals. ASF has caused a small number of isolated outbreaks in central Russia, north of Kazakhstan and Mongolia, approximately 1,000 km from the border with China. Unlike Eastern Europe and west Russia, there has been a paucity of updates on the status of ASF in central Russia. 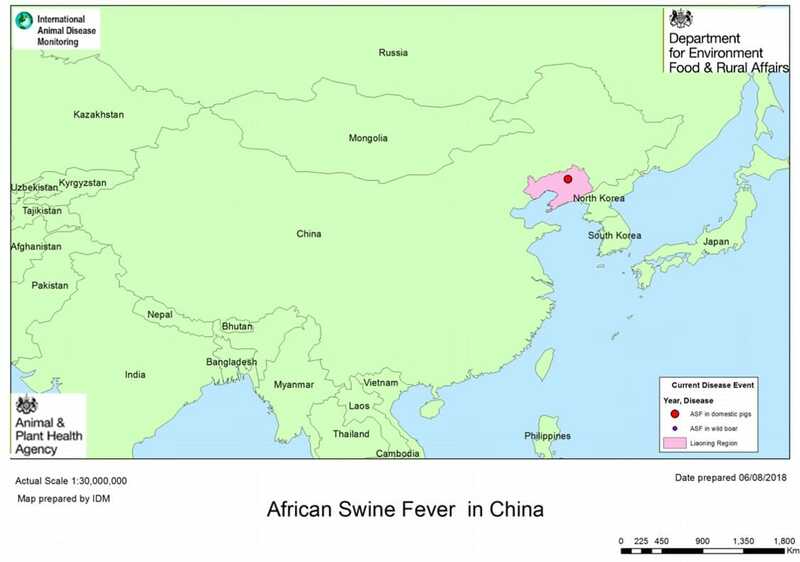 The FAO has carried out a risk assessment for the incursion of ASF into China using expert opinion (FAO, 2018), which concluded that China’s north-eastern regions (Heilongjiang province and Inner Mongolia) are the most likely sites for incursion of ASF. The detection of ASF in a pig farm in China, just north of North Korea, on 1st August 2018 represents a new jump in geographic spread. Its origin is unknown at present. It is also unknown at present whether this represents the index case. China carries out early warning surveillance in this region, however, it is focussed on large commercial pig farms, rather than the small semi-commercial and backyard sectors. China is home to about half of the global pig population, with thousands of backyard and large-scale farms operating in the northern, central and southern regions. It produces about half of the world’s pork and China is the largest consumer of pig meat. Smallholding farmers are less likely to have high standards of food safety or strong biosecurity in place to prevent the virus entering the population. A large wild boar population will promote persistence and spread. Eurasian wild boar are distributed throughout much of south-east Asia. If the source of infection is the movement of infected wild boar, there is a strong possibility of further spread to Southeast Asia including the Korean Peninsula through wild boar alone. Japan has tightened quarantine operations at airports and seaports, especially for travellers from Shenyang and Dalian, near where the infection was found, using more sniffer dogs than usual and alerting travellers to China’s outbreak of ASF. In addition, there are other wild suids to consider which may be present in China and south-east Asia, together with Ornithodoros argasid tick species. The introduction of ASFV into eastern China and potentially further into south-east Asia represents a new threat for the pig population in this region. Currently, China is not approved for the import of fresh or frozen pig meat to the EU. Some animal feed products are imported from China, and we are investigating other possible pathways. The risk to the UK is assessed to be negligible in terms of this particular new report. The overall risk given the current distribution of ASF in the EU and neighbouring countries is low. As with ASF in western Russia, Belarus, Moldova and the Ukraine, there are concerns around pork products from non-EU countries entering the EU in passenger luggage and then being discarded in areas where wild boar or domestic pigs are present. Publicity campaigns are in place to discourage individuals from bringing pork products into UK. The risk of ASF introduction to the UK was previously raised to “low” in August 2017. This reflected the spread of ASF westward from Eastern Europe. Despite the spread of ASF to China, the current risk of ASF introduction to the UK is still considered to be “low”, although the situation is being kept under review and depends on how ASF spreads both within China and across other parts of south-east Asia. We would like to highlight to all pig keepers and the public to ensure pigs are not fed catering waste, kitchen scraps or pork products, thereby observing the swill feeding ban. All pig keepers should be aware that visitors to their premises should not have had recent contact with pigs and pig premises in the affected regions. Anybody returning from any ASF-affected area should avoid contact with domestic pigs, whether commercial holdings or smallholdings, areas with feral pigs or wild boar, until they are confident they have no contaminated clothing, footwear or equipment. Pig keepers and veterinarians should remind themselves of the clinical signs for ASF. Any suspect cases must be reported promptly. A campaign to highlight the dangers of swill feeding has been launched and more information can be found at this link. Please see the website for more information. We would like to remind the public that any feeding of meat products, including the feeding of swill, kitchen scraps and catering waste, to wild boar or feral pigs is also illegal.